Last year, when Northern Iowa took out Kansas in the second round of the tourney, it forced me to revisit the top 10 upsets in NCAA tourney history. I'm not sure who I take off that list, but I have to include VCU's run very near the top, particularly as nobody was more beat upon than VCU heading into the tourney: they had to play a 'play in' game, they were likely the 68th and last team selected for the tournament and every talking head within ear-shot of a microphone cried foul, opining that VCU didn't deserve the last bid, they generally sucked and so on; then they went out and beat Georgetown, Purdue, Florida State and Kansas. If VCU is a complete fall over and get the smelling salts kind of shock, the return of last year's runner-up Butler is less of a shock. Still the Bulldogs were an 8 seed (which pretty much tells you where the selection committee thought they'd end up) and Butler is the only team from a mid-major to play into the Final Four in back to back years since the 1990 and 1991 UNLV teams (since the tourney expanded to 64, that is.) Pretty impressive on Butler's part, no? If 2008 was the most predictable, chalk Final Four of all time, with four No. 1 seeds meeting (yawn, big, big yawn), 2011 is the antidote to the chalk. If you think this is the nuttiest Final Four ever, you would be right. What Final Fours fill out the remaining Top 5 Most unlikely? To determine that, I've used the very scientific method of relying on my prodigious memory plus google, and starting with the Bird-Magic Final Four (1979). 1. 2011 -- UConn (3), Kentucky (4), Butler (8) and VCU (12*). There has never been a year like this, not even one that comes close. To have two mid-major teams in the Final Four is stunning. Most years, we don't even get one. But to have the Colonial Athletic Conference and and the Horizon League represented makes this THE most unlikely Final Four of All-Time. By a ton, in fact. VCU, a 12* seed (don't you think that a 12 seed that had to 'play in' deserves an asterisk?) and Butler, an 8 seed, have outlasted all four No. 1 seeds, all four No. 2 seeds and all but one of the No. 3 seeds. No way on God's green earth did anybody see that coming. You have to go the whole way back to 1980 to find a Final Four sans a single No. 1 seed (bear in mind, that was when the tourney field was only 48 teams.) Amazing. 31 straight years with at least one No. 1 seed in the Final Four. 2. 2006 -- LSU (4), UCLA (2) George Mason (11), and Florida (3). 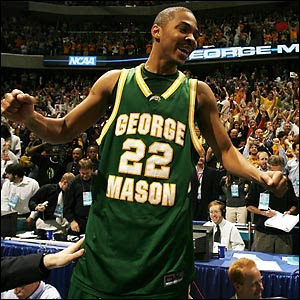 I still marvel at George Mason's run to the Final Four. There's always an upset in every tournament, but for GM to run through the field to the Final Four ... well, we hadn't seen anything like it in a long time. And I didn't expect that we'd see anything like it for many years to come. Plus, in 2006, we had no clue how good that Florida team was yet. 3. 1980 -- Iowa (5), Louisville (2), Purdue (6), and UCLA (8). Okay, this is a collection of household names (Iowa less so, unless you're counting football and wrestling), but notice the complete lack of No. 1 seeds. 1980 was the last time we had a Final Four notable for the absence of 1 seeds. 4. 1979 -- Indiana State (1), Depaul (2), Michigan State (2), Penn (9). From a field of 40. Yeah, yeah. Indiana State was a 1 seed, but really, this is way before expanded cable and light-years before the internet. Had anybody outside of Terre Haute seen Indiana State play prior to the tournament? Penn was in the Final Four? Penn? As in the University of Pennsylvania of the Ivy League. Yup. Bird. Magic. Everybody paid attention. Nobody saw this coming, but it fixated a nation. And we haven't stopped watching since. 5. 1985 -- Georgetown (1), St. John's (1), Villanova (8) and Memphis State (2). I went back and forth on this one (plus the two bonuses below.) Two No. 1 seeds? Power conference? But, what are the odds that one conference would send three teams to the Final Four? It hasn't been done since. Then there is the whole giant upset of Georgetown. In fact, I think that I penciled them into my bracket as the winner of the whole thing back on Valentine's Day, 1985, that's how good they were. So, for the unlikely upset, plus the Big Beast having three teams advance, I'm including this as No. 5 on the list. Honorable Mention: 1983 -- Houston (1), Louisville (1), Georgia (4), N.C. State (6). (from a field of 52.) I'm including this because Houston Phi Slamma Jamma was, indeed, a power team, but not from a power conference. Then, you consider the amazing upset in the final by Jimmy V's N.C. State team, and I had to include 1983. Honorable Mention. 1991 - UNC (1), Kansas (2), Duke (2), and UNLV (1). I thought I should mention this Final Four because this is ONLY other time (since the tourney expanded to 64 teams) that a team from a mid-major conference made it through to the Final Four two years in a row. I know that UNLV was a powerhouse and I know that a Final Four rounded out by UNC, Duke, an Kansas is hardly a line up of obscure underdogs, but Tarkanian's Runnin' Rebs deserve at least a cursory nod.